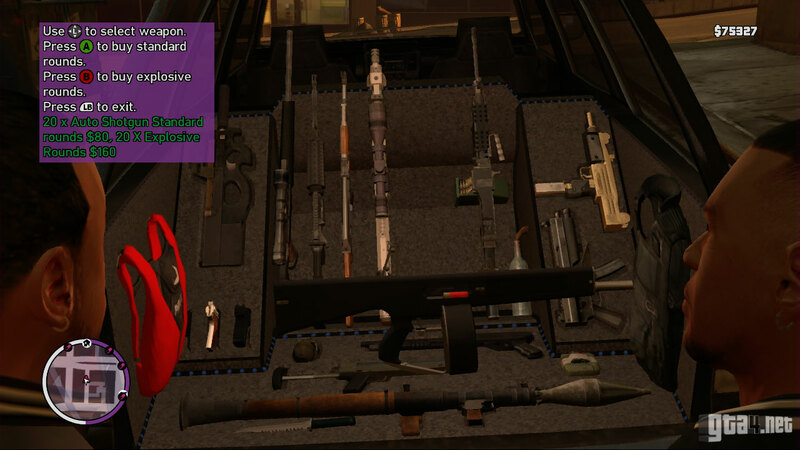 The new weapons can be purchased from Armando's Gun Van. Call Armando and select the "Gun Van" option. Armando will meet you at a nearby location and sell you weapons at discounted prices. This is the primary method of obtaining weapons. New weapons are unlocked as you progress through the story. Visit the underground gun shops located in basements and alleys throughout the city. There is one in Broker, one in Algonquin and one in Alderney, and they are each marked on the map. Please note that only the standard weapons are available at the gun shops. Do drug war missions. For every ten drug wars that you complete, a new weapon will spawn automatically at your safehouse. Using this method, you can unlock five weapons in total in the following order: Pistol.44, Advanced MG, Explosive Shotgun, Sticky Bombs and Gold SMG. Also available in The Lost and Damned. Parachute pickups are located throughout the city. Click here to see a map of all the locations. Remember to deploy the parachute after you jump, unless you want to end up as a puddle on the ground for some bizarre reason.